Lots of new products have rolled out onto our US Cargo Control website lately, including many in our flatbed trailer group from Merritt®- a trusted manufacturer in the industry. If there’s a product or a group of new items you’d like to see added to our website, be sure to let us know- either by a comment below or contacting us at 866-444-9990. 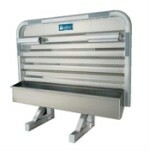 A Merritt® Equipment headache rack is an excellent investment for a truck/trailer. Sometimes also known as limited security racks (LSR) or cab guards for trucks, these not only look sharp but can add a measure of security to the cab in the event of an accident. We offer two aluminum cab guard styles: 70″ wide with E-Z view window and an 80″ wide with chain racks. Both feature Dyna-Tube extrusion on the outer edge for a tough yet smooth aerodynamic border. Mounting kits in both a 17″ size and a 21″ size are also available so you’ll have everything you need for easy installation. It’s not too early to be thinking of winter driving. Tire chain holders that mount right to the frame are a great way to keep chains organized, and a locking lid keeps them secure. The space-saving design is only 8” wide and is available in both an 18” size for frames with fairing packages and a 24″ size for open frame models. Also be sure to check our selection of tire chains. We offer two styles, both from Pewag, a trusted manufacturer in the chain industry. 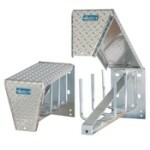 Aluminum Dyna-Deck covers are a simple, fast way to create sturdy walking deck spaces on your rig. 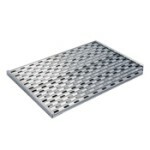 The top-mount design is ribbed to create a non-skid surface and allow for draining. Variable mounting points make them easy to install, with no drilling required. All are 33.25″ wide so they easily slide together. Choose from three different lengths: 18.5″L, 28″L, 37.5“. Each deck cover meets DOT regulations for a walk area.